The World's Largest Airline Collectibles Show & Convention celebrates its 42nd year in Washington DC! Join other commercial aviation enthusiasts from around the globe as they descend on our nation's capital, WASHINGTON DC! Daily admission Children 12 and younger free with adult admission. Please click on link for the AI 2018 Registration is now open online. Space for More Than 180 Vendor Tables Buying, Selling, & Swapping Airline Memorabilia. Thursday, July 12, 2018, 2:00 - 6:00 p.m.
Friday, July 13, 2018, 9:00 a.m. - 6:00 p.m.
Saturday, July 14, 2018, 9:00 a.m. - 3:00 p.m.
Online booking for AI 2018 DCA hotel reservations is now available at the hotel. Please click HERE for the link to the DoubleTree by Hilton website for the special AI 2018 rates. Note: Our member, Shea Oakley was Former Co-chair of the Airliners International Convention in Newark, and presently isTrustee for the World Historical Society. Photo: Eastern Flight Attendants were planning to fly despite the rumors of the imminent shutdown, January 1991, Courtesy Atlanta Journal Constitution photographs collection. Exhibit Hours 8:30 A.M. - 6:00 P. M.
Lawyers who help firms navigate the thicket of laws and regulations governing the embargo and dealings with the island have been combing through a memorandum that Trump signed on June 16 as well as three pages of frequently-asked questions issued by Treasury’s Office of Foreign Assets Control (OFAC) and a White House fact sheet to get a sense of the new policy. Until the regulations are written, that’s all they have to go on. Trump has mandated that the regulation-writing must begin by mid-July. President Donald Trump signs policy changes he is making toward Cuba at the Manuel Artime Theater in the Little Havana neighborhood on June 16, 2017. “Until the regulations change, everything is status quo,” said Yosbel Ibarra, a Miami lawyer on Greenberg Traurig’s Cuba practice team. How long it will take to write new rules is anybody’s guess, but it isn’t an easy task because multiple agencies and departments will be involved. Some key posts that would have oversight over the new policy also have yet to be filled by the Trump administration, according to lawyers. Don’t expect a rush by U.S. companies that have proposals pending before the Cuban government to get deals inked before the new rules go into effect, say lawyers and business consultants. 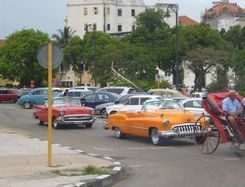 Expedia has announced travellers can now book hotels in Cuba on its global points of sale.The destination continues to generate interest as a hot destination among traveller; its ministry of tourism reported more than four million foreign visitors in 2016, with the biggest increase in visitor numbers from the US. From the colourful and historic streets of Havana and Hemmingway’s homestead in San Francisco de Paula, to the cobbled colonial town of Trinidad and beyond, travellers from around the world can today leverage Expedia sites to research and book properties throughout Cuba. With hotel options spanning from the east to the west side of the island, there will be no shortage of accommodations for consumers to choose from, including Pinar Del Rio, Camaguey, and Santiago de Cuba. Expedia has been closely working with local Cuban partners to bring travellers to this widely-anticipated market, and make the hotel booking process as easy as possible. “We’ve been working around the clock with our partners to be able to offer this iconic, culture-rich destination to our global customers, with the added convenience of online booking through a trusted travel partner,” said Mario Ribera, vice president of market management for Latin America. Both US and non-US travellers can research and book their Cuba accommodations in compliance with OFAC regulations on Expedia points-of-sale globally with US travellers certifying that their travel falls under one of 12 categories of authorised travel. Spirit Airlines’ Cuba fever is cooling down — big time. The ultra-low cost carrier is ending its Havana flights from Fort Lauderdale-Hollywood International Airport in June. That makes it the fifth U.S. airline to cut back flights to the island after an initial rush of service that began last August. Miramar-based Spirit started flying to Havana’s José Martí International Airport early this year, after being approved for twice-daily service to the Cuban capital in 2016. But weak demand — and overblown expectations — has taken a toll at Spirit and other airlines that overshot demand for travel to Cuba. Before cutting service completely on June 1, Spirit will operate an adjusted schedule that will reduce its daily flights to one in the morning from May 3 to 23. From May 24 to 31, the carrier will operate on its twice-daily schedule before ending flights altogether. Passengers already booked on an affected flight, such as the afternoon flights being cut in May, will be re-booked to the morning flight, Berry said. Those with flights beyond May 31 will get a full refund, he said. All affected passengers will receive a $50 voucher for future Spirit flights. Spirit joins American Airlines, JetBlue Airways, Frontier Airlines and Silver Airways in reducing service. American Airlines was the first to reduce its service to Cuba, announcing in November that it would cut flights from Miami International Airport to Holguín, Santa Clara and Varadero from two daily to one. JetBlue announced it would move to smaller planes on several routes, including from Fort Lauderdale, to Havana, Santa Clara, Holguín and Camagüey effective May 3l, dialing back capacity across all routes by 300 seats a day. Spirit joins American Airlines, JetBlue Airways, Frontier Airlines and Silver Airways in reducing service to Cuba. In December, Silver Airways reduced the number of flights on six of its nine destinations to the island before announcing in March that it was cutting service to Cuba altogether on April 22. And last month, Frontier announced it would completely eliminate its Miami to Havana route on June 4. “The problem here was that there was so little data to work with. Usually when an airline considers new nonstop service in a market, it can, for example, look at how many people are already flying between the cities on a connecting basis and try to project how many more might fly if a more convenient nonstop flight existed,” Kaplan said. “In this case, there was just no scheduled commercial service at all, not even connecting service. They always knew it was a long-term play, and they wanted to grab the scarce Havana rights while they could, but clearly they didn’t expect it to be this bad. Seth Kaplan, managing partner at trade publication Airline Weekly. The question is now, who’s left? Those Barcodes Do Mean Something: You're a standby passenger and you're lucky enough to be boarded on your flights. You receive the same boarding pass as every other passenger. And, while your barcode won't have as much personal data stored on it as a full revenue passenger, it may still include information such as your name and employee ID number, which is included in your PNR from your flight listing. Our advice, it's best to destroy your boarding pass rather than just wading it up and throwing it away. Fact or Fiction? Do Hotel Key Cards Store Personal Information? Fiction. It's a misnomer that these cards hold your personal data. It is limited to basic information (e.g., room number, access code, activation and expiration dates), and even at that, it's encoded as a serial number which a door lock reads, decodes, and uses to determine whether or not the inserted key is authorized to open it. "Don't worry about the world ending today. I'ts already tomorrow in Australia." U.S. and British officials said Tuesday the decision to bar laptops and tablets from the cabins of some international flights wasn't based on any specific threat but on longstanding concerns about terrorists targeting jetliners. Unimpressed, some travelers and civil liberties groups denounced the ban, raising concerns that included lost work time on long flights and worries that checking laptops in baggage will make them more vulnerable to theft. FILE - In this Jan. 7, 2016 file photo, a laptop is seen in Las Vegas. Royal Jordanian Airlines is advising passengers that laptops, iPads, cameras and other electronics won’t be allowed in carry-on luggage for U.S.-bound flights starting Tuesday, March 21, 2017. John Locher, File AP Photo. Under the new bans, electronic devices larger than smartphones, such as laptops, tablets and gaming devices, will have to be checked on some international flights. American officials announced the U.S. ban early Tuesday, and the British followed later in the day after discussions between the countries. The U.S. ban affects flights from Amman, Jordan; Kuwait City, Kuwait; Cairo; Istanbul; Jeddah and Riyadh, Saudi Arabia; Casablanca, Morocco; Doha, Qatar, and Dubai and Abu Dhabi in the United Arab Emirates. About 50 flights a day, all on foreign carriers, will be affected. Senior Trump administration officials who briefed reporters about the ban said no U.S.-based airlines have nonstop flights from those cities to the U.S. The British security rules will apply to flights from Turkey, Lebanon, Jordan, Egypt, Tunisia and Saudi Arabia. A U.S. government official said the ban was not prompted by any new or specific threat uncovered in recent days, but rather was based on awareness of continuing terrorist desires to target commercial aircraft. Terrorists are aggressively pursuing new methods to conduct attacks, including smuggling explosives in consumer items, the official said. That official spoke on the condition of anonymity because the official was not authorized to discuss internal government security discussions. The administration officials who spoke to reporters earlier said the security change was the result of "evaluated intelligence." They noted that an explosion aboard a Daallo Airlines flight in Somalia last year was believed to have been the result of a laptop-borne bomb. That explosion killed only the suspected bomber. I made new "friends" from the Gate1travel.com group and had a great time taking pictures, videos of monkeys, etc., and they made sure I was ok the whole time we toured Thailand. Jon and Natalya who posted amazing pictures along with Alex, who has a great camera, too. The ages are 35, 40 and 41 and…included me, Grandma for the entire trip. They did not let me carry anything and really made my trip easy. Miguel, who had a great camera took other pictures of I think, Attapaya. We saw the Summer palace of the King of Siam, who died October 13, 2016. The widow was still there but probably not for long. His first wife and children drowned in a boating accident (unable to swim). He was so grief stricken that he went to Europe and had 3-4 children and no one was sure if he married the mother or not. I think she lived in France. Maybe that is why the languages are Thai, English, and French. Maybe or maybe not…but one of the sons from France may step in and become the King. Then the King of Siam returned home to Thailand and married the current woman who is now his widow. There, the widow stays inside and does not come out (probably depressed that she will probably be evicted). Anyway, that was story from our Tour Director. We roamed around Bangkok for 3days and we had meals together. Jon completed two tours in Iraq and he and Natalya are married and they live and work for DOD in CMH. A great group of people making all of us have a great trip. By the way, I also met a lady from South Tampa, Lana. Perhaps she may be a potential travel companion. We climbed five levels of the Erawan National Park. There are Waterfalls and a Swimming Lagoon at each level. A lot of people did not climb anything that day and some only climbed three levels. We had a day at leisure so about 12 of us rented a van and driver and that were an excursion Off the River Kwai and spent the day there. One of the couples from the Canal Zone, about 50-55, wanted to see a temple that was not on our list of...To Do Items…so late one afternoon, as mentioned, we rented a contraption along with a driver...too far to walk, probably 8-10 miles from our hotel. Our return back to hotel was one wild ride and Alberto, who was born in Cuba but moved to Miami with parents when he was 1 yrs. old, is about 6'5" and Jon and Alex were pretty tall also, so every time we hit a bump their heads hit the top of that metal roof. Then there were 3 gals and none of us are midgets…but that was a lot of fun...I am trying to get a video of that ride from Alex. Helper gives everyone a package of hand wipes and another bottle of chilled water about every 2 hours. There is always something to stop for as we drive along on the bus tour. I admit though I was secretly happy it had just started to rain just before we were scheduled to ride the elephants. I knew a lady who fell and broke arm in India when she went on that with her husband. Not sure I want to go to India anyway. Frankly I can do without that smell, too. This was my 5th Gate One Travel and they take really great care of people. They use five star (*****) hotels, even in Beijing, Shanghai, Dublin, Peru, Lima, Cuzco, and Bogota. Never put you up in a flea bag place and that River Kwai resort was excellent. They feed you an all day breakfast too. Plus, most other meals. This last one I bought dinner twice and I know a United Airlines Flight Attendant in LAX. She was a Flight Attendant for EAL in Miami for 2 yrs., and then she went with United in LAX after Eastern died. But…I still want to see the world, except it is too dangerous now. So I had to scratch off several in recent years. Waaaay too many idiots out there now. On the Episode 310, Monday, March 20, 2017, when Neal was talking about movies in 1992, it brought me back to GSP. We still had an $850 mortgage in Tampa. We had just built our retirement home and wanted to get it paid off. We were very lucky my husband got hired by Lockheed on April 3 1989. Doing the exact same job he had at EAL in Tampa (thirty days after bankruptcy). I know EAL limped along until January 17, 1991, but to me, March 3rd will always resonate in my head. Don and I left for the Fort Lauderdale, FL airport to travel on Silver Airways Flight #102 on Friday, December 23, 2016 for Varadero, Cuba. Don had won travel passes for 2 at the 2016 2nd Annual Eastern Airlines Pioneers Reunion and Celebration, compliments of EARA. The Silver Airways Reservation Agents took extra good care of us seeing that Don was a former Eastern employee. We were quickly checked in on our standby passes, and given our seat assignment and a Visa to fill in (cost of $75.00 each) and then quickly sent to U. S. Customs to make our flight. Next we had to fill in an Affadavit at the Ticket Counter needed for Cuban Travelers, otherwise you couldn’t board. Interesting enough we went down the jetway through doors but instead of going into the plane, it lead outside to a roped area on the tarmac, and followed into a waiting shuttle. It was windy as usual and not a good hair day! Our flight on Silver Airways was a prop plane and not the best way to travel, however, it was only an hour 40 minutes flight. We had a good deal of turbulence that could be felt quite a bit and asked to remain seated with seat belts, which wasn’t a problem. We waited in Cuban Customs filling out another form then onto another room for a luggage check again. However, we were stopped by a medical nurse to fill out a hospital record before being allowed to leave at a cost of $25.00 each. The Cuban terminal was quite old but up to date. We changed our American dollar currency into Pesos as American Cash/Credit cards were not accepted in Cuba. The American dollar was worth $.87 cents but when we planned this trip originally, it was worth $1.34. Outside the Terminal were 25-30 cab drivers all asking to drive us and we finally secured one for the 2-hour drive from Varadero, Cuba to our Havana Hotel, El Bosque. Check-in was quick so we took the elevator up to our room on the 2nd floor, and unloaded the luggage. We cleaned up for dinner and as I set up the Converter plug for cell/tablet charging, we lost electricity and had to get service personnel to restore. Our hotel was 4 star rated, but the marble floors and tiles were very old. Architecture was beautiful. We did have a king size bed even though they advertised 2 double beds. The room was very nice and had a small balcony overlooking a Nature forest. We had plenty of hot water and clean towels etc. I had read reviews that sometimes you were lucky to have hot water and some folks actually had none for the entire week they were there. So we considered ourselves very lucky. The wait staff was super, and most spoke some broken English and enough for us to get by without a problem and ordering our dinner from their menu (which was Cuban with an English translation on the menu) was not a problem. Cuban dinner was served with a flair, and delicious and inexpensive. The next morning, a full Continental breakfast and off to our previously arranged 3-hour tour of old Havana, Cuba. I had researched on the Internet and found Cuba Irresistible Tours with high reviews of our guide, Ary, and he was exceptionally knowledgeable, very kind, and courteous. The weather was beautiful the entire vacation. We learned so much of the beginning of Cuban from Ary as he guided us through the original Havana and related the story of the Spanish conquistador, Diego Velázquez de Cuéllar who first sited Havana in 1515. The area was renamed in 1519 as San Cristóbal de La Habana. This name came from the patron saint of travelers San Cristobal, although some say it is a derivative of Christopher Columbus. Unfortunately, four years later the settlers moved to the present site of Habana Vieja (Old Havana) on the west coast to the channel leading into the harbor. Although the capital of Spanish Cuba was initially Santiago de Cuba at the eastern end of the south coast of Cuba, it was transferred to Havana in 1592. The first industry of Cuba was panning for gold. The Spanish war ships arrived and took the natives prisoners, and had natives pan enough gold to keep the Spanish pursuing it for several years before giving it up in 1547. A Spanish settler, Hernan Cortéz, left for Mexico taking with him the stock of gold. Later Havana became a key port for ships traveling between Spain and New Spain as the ships needed fresh water, dried meat, leather and wood for repairs. The climate of Cuba only allowed growing “casabe” which is made from a flour ground from the roots of the yucca plant and depended upon the rain to keep it watered which they caught and stored in cisterns. Then in 1550, Havana authorities brought in fresh water from the Almendares River and dug a canal (zanja) but money was an issue so the King of Spain authorized an anchoring fee to discourage some ships from stopping at Havana. The economy deteriorated and in 1562 the anchoring fee was rescinded and taxes were imposed upon Havana residents. The canal was completed in 1592 and fully paid by 1600. Havana now was under siege by Pirates and the fleets carrying treasure from the Americas to Spain rendezvoused at Havana to travel in convoys across the Atlantic. As a result of this Havana was the target of French, English and Dutch marauders. Pirates began attacking Havana and in 1537 it was captured. In 1555 the famous French pirate Jacques de Sores captured the city of Santiago de Cuba in the east. He demanded a ransom that the residents could not pay so he burned their homes. Later he went to the countryside and captured landowners and slaves and Sores had them hung. A dedicated place in the Plaza was on our tour to see. The Spanish decided that given the key role played by Havana in the transporting of gold and silver that they should build fortifications and a city wall to protect Havana. It was started in 1558 and the fort was called El Castillo de la Real Fuerza (The Castle of Royal Might) and completed in 1577. In 1589 King Philip of Spain ordered the building of two forts at the entrance to the harbor called The Castle of Saint Salvador of the Point and The Castle of the Three Kings of the Cliff, that one which popularly is known as El Morro. Their construction required financing and they began to tax shipping. We were toured through the Nacionale Hotel where the battle of Cuba and Spain took place. We saw massive cannons that were entrenched and absolutely enormous. We also toured the bunker showing written banners of the original conflict between American and Cuba over the Russian missiles entering Cuba. We were then escorted by taxi to the next El Morro fort where we saw the Russian missiles, planes and cannons that were going to be used against the Americans during that conflict. The last of our tour was up to see the enormous tall and beautiful statue of San Cristobal overlooking the harbor. Christmas Day we went to the Nacional Hotel in Old Havana which is gorgeous and though expensive rooms, the restaurant was inexpensive compared to U. S. 5-star restaurants, and we were quite surprised. Fabulous dinner all the way around at The Aguliar Restaurant. This exquisite spot is named after the Havana defender Don Luis Aguliar who forced the British back from the bluff now occupied by the hotel during their invasion in the 18th century. Perhaps the most elegant restaurant in town, its finely crafted ceiling, beautiful vases and hanging lamps are testimony to the fine design of this exceptional setting. Our Christmas dinner was great. Just a tremendous visit of old historic Havana. Another great restaurant one night was the Nero di Scippio Italian Restaurant, Havana, Cuba which was recommended by our taxi driver, as the owner is a family member of his wife. We reviewed the menu which clearly indicated all selections in English. The dinner was fabulous and again inexpensive for what we ordered. The next day, we had another free full breakfast, and left Havana, Cuba after having such a wonderful 4-day vacation. We hired the same driver, and he took us for the 2-hour drive to the Varadero Airport. Once there, the airport was packed and we received notice that our plane was delayed in take off due to the many holiday travelers. Canadian vacations north were cancelled and some delayed due to weather. Once we boarded, it was a 1-hour flight to Ft. Lauderdale. We had a 3-hour wait in customs though, but as we expected, due to the threats on our country in the past. We have all learned that patience is a virtue and we must be patient to allow security to do their job. Wonderful visit to Cuba, such a beautiful country with very kind and friendly Cuban people to make our memories of Cuba a great one. But remember... don't forget to Exchange your Cuban money at the Cuban airport before departing for the U. S. You cannot exchange Cuban currency here in the U.S. or you will lose it as we did and are stuck with the Cuban currency.